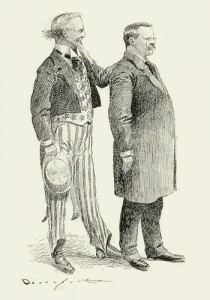 Of all the famous personages that Homer Davenport knew and called friend during his brief years in the limelight, perhaps none was more influential than the 26th President of the United States, Theodore Roosevelt. Davenport’s respect and enthusiasm for “The Colonel,” as he preferred to be called, supposedly was the reason Davenport left Hearst in 1904. 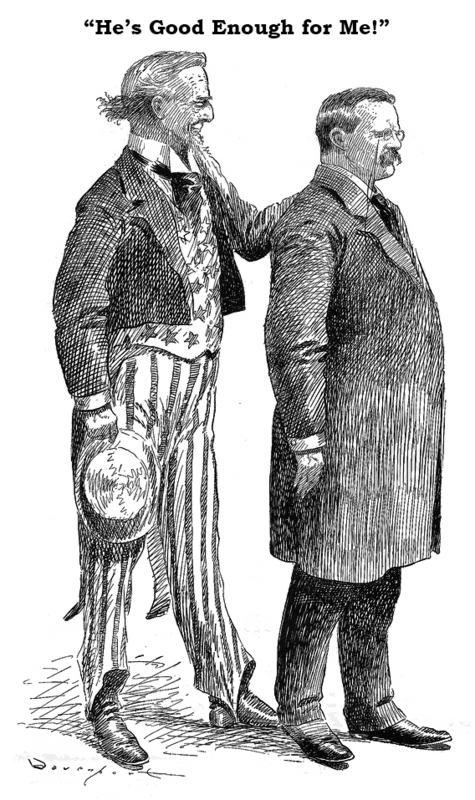 This year he also created one of his more famous cartoons, the influential He’s Good Enough for Me (left), with Uncle Sam’s arm resting on T.R.’s shoulder. Many have said that this single cartoon elected a President. Whether or not that’s true, the facts are that two years later at Davenport’s request, President Roosevelt directed the State Department to initiate contact with the Ottoman Empire, for the purpose of importing Arabian horse breeding stock. This acquisition expedition was a success, and today the Davenport Arabian Horse is the offspring of that one cartoon. Colonel Roosevelt has remained a household word over the years, and even boasts a head on Mt. Rushmore. 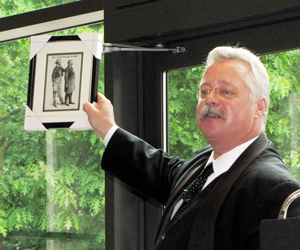 So much so, that in mid-May of 2013, the Oregon Historical Society with sponsorship by Wells Fargo Bank hosted a week-long “Roosevelt Roadshow” featuring Theodore Roosevelt re-enactor Joe Wiegand. They visited numerous Oregon communities, culminating with his last performance at the OHS Annual Membership Meeting in Portland. I figured it might be a good gesture for The Davenport Project to present the Colonel with a framed reproduction of the He’s Good Enough for Me cartoon. I assumed that I could walk up after his talk and present the cartoon and maybe get a picture. That was the plan anyway. As it turned out, I arrived too early for the festivities, so I killed some time exploring the Museum. While in the USS Oregon/Spanish American War room door stairs, I encountered a familiar character who immediately struck up a conversation with me, introducing himself as Theodore Roosevelt. I shook hands and said “A pleasure to meet you, Colonel.” to which he exclaimed that “My friends call me Colonel! I detest Mr. President.” He asked where I was from and if anyone of note was from there. I answered that I was from Silverton, Hometown of one of his old friends. I then gave the “Homer Davenport” elevator speech and mentioned the famous cartoon. I then presented him with the framed copy I was carrying. The Colonel was obviously impressed. He was quite well acquainted with this particular cartoon, but was apparently unaware of Davenport’s Oregon roots. He said it was the best gift he had yet received during this trip. I included a letter with a brief bio of Davenport and his T.R. connection. He then asked me if he could incorporate the picture into his talk, and the rest was a delightful presentation of history, complete with a rather robust tribute to Davenport and Silverton! And as Homer could attest, even this “T.R.” put on a great show! This entry was posted in Cartoons, Events, History. Bookmark the permalink. 5. Art: Dollar or the Man?